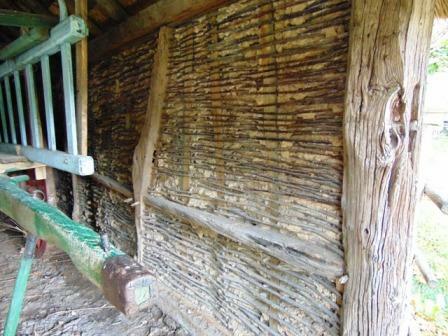 Wattle and daub: braided twigs, woven lattice and loam (or mud) (sometimes called: pine and pug). The filling consisted of braiding (wattle) of (split) willow, oak, buckthorn or hazelnut, which was covered with a mixture of straw (as binding structural element) and loam. Vertical wooden stakes are inserted into holes in the beams. (The upper hole is deeper, so first you can insert the stick there. Afterwards you get it easier in the shallower bottom hole.) Also attached to the oak post are staves. In between were then braided thinner twigs. Simultaneously along the inside and outside the clay is pressed into the braid and swabbed. It can be finished with a layer of pure loam (without straw). If you go on rubbing with a wet hand (or stone, shelf) it’s made smooth. If it's dry, it takes several months, it will also shrink. The resulting joints you should shut again with loam. Later, it was also proceeded to the whitewashed walls. Originally they remained in mud color. Inside it is a lot lighter when everything is whitewashed. The woodwork was also chalked with lime distemper. Under the influence of tourism to the Eifel, the beams were later colored black (tar). Still later, the filling of the panels was done with brick. Especially for the bottom, this is a good idea. Loam that is wet from rising damp can break loose or dissolve. Also ceilings could be made ​​this way. Then, they made between the beams a carcass of light bent twigs which have been completed the same way with loam. This construction method gets more attention again. She is completely ecological and all products are 100% recyclable. You can re- wet clay, and build again with it. Or use it in the garden. The walls are very sturdy, breathable and insulating. Mud walls regulate moisture and heat. They take it and give it again, so the humidity stays normal around 50% (± 5%). Ideal for a home. In the Middle East, North Africa and South America, the clay / straw style is called adobe. The compressed blocks (adobes) are dried in the sun. The clay can be crushed between formwork panels.